A woman and child were taken to hospital after the car they were in crashed into the front of a shop. Emergency services were called at 2pm on Monday when the Peugeot collided with a Ford Fiesta at the junction of Gidlow Lane and Park Road, in Gidlow. It was propelled into the front of The 1:1 Diet shop, which was closed at the time, and hit its roller shutters. A nine-year-old child and a passenger were able to get out of the car, but fire crews needed to cut the female driver out of the vehicle. 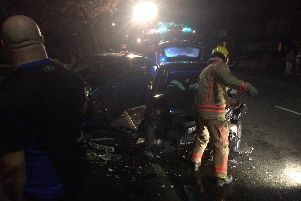 Two fire engines from Wigan and a technical response unit attended and cut the roof off the car. The woman was taken to hospital by ambulance for treatment to a hip injury, while the child also needed hospital treatment for a head injury. Roller shutters on the front of the shop were damaged and firefighters forced their way inside to make sure the property was safe. The building was not thought to have extensive structural damage, but the shop could not open for business. The road was closed for some time while emergency services worked at the scene.